Tufty wins another international award! TUFTY will air on Irish national TV this Monday 4th April, RTÉ 2, 23:25. Set your telly box and don’t miss it! 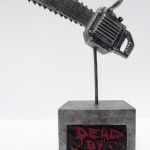 Tufty’s Dead by Dawn award arrives!